Butterfly Records is an ULTRA cool label based in Barcelona, Spain that have released some fantastic 7" vinyl records. We reviewed a handful of their releases in AI #24 and now have 6 of their latest. All of the following are limited editions of 500. 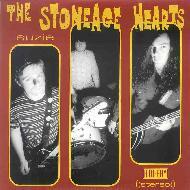 The Stoneage Hearts are a trio from Melbourne, Australia whose 3-song single illustrates a variety of 60's influences. "Suzie" is an excellent thrashy garage-psych rocker with a 60's edge and a great raw and dirty sound. "Shoot My Mouth Off" is slower paced and reminds me of a Rolling Stones song in both sound and attitude. "The Bitter Thoughts Of Little Jane" is different still, being a bouncy 60's style pop tune with an almost bubblegum feel. Great stuff, all the songs being catchy and well composed. I'd love to hear more. Email The Stoneage Hearts at thestoneagehearts@hotmail.com. 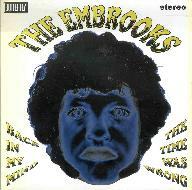 Continuing the loving memories of the 60s are The Embrooks, a UK based trio who have numerous releases to their credit, though this 2 song single is my introduction to the band. "Back In My Mind" is a very cool pop-psych song with a heavy rocking edge. A solid mixture of song and tasty little instrumental bits. And "The Time Was Wrong" further demonstrates The Embrooks' flair for psychedelia and songcraft. Another band I'd love to hear more from. Visit The Embrooks web site at http://www.embrooks.freeserve.co.uk or email them at embrooks@ntlworld.com. The Creatures Of The Golden Dawn, a quartet from Bethlehem, Pennsylvania, are yet another band that show a variety of influences across the handful of songs on their single. "Blood From A Stone" is a soulful psych rocker with a bit of a Seeds vibe and luscious fuzzed out trip guitar. "Almost Grown" is a boogie woogie rock ‘n roll song, presented with a sneer but plenty danceable. "The Other Day" has a folk sound, bringing the Byrds to mind at times, though the Creatures are firmly in the garage. And "Seeing Things" is a cool tune that sounds like a Jefferson Airplane song covered by the Rolling Stones. South American Teenage Garage Punk is the first volume in a planned series focusing on the South American garage underground. The Tandooris' "You Complain Too Much" is a catchy, quirky, punky garage psych tune with brief but ripping trip guitar. Los Peyotes' "Vampiro" is a surf-punk garage rocker with killer organ and guitar that will have you dashing for the beach with all due speed. Elio & Thee Horribles chime in with "Ain't No Friend Of Mine", a catchy, angry garage-punk tune with more cool keys and guitars that bring back the fondest memories of the 60's. And The Supersonics are a trippy instrumental ensemble that really do sound like one of those old time 60's experimental pop outfits like Les Maledictus Sound or something like that. The music is based in surf-pop, but there's loads of freakiness and efx. Lots of great songs here and I hope Butterfly releases volume two soon. 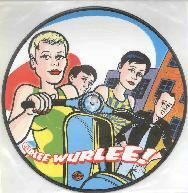 Curlee Wurlee are a German based self-described beat-pop-punk band who have several releases under their belt. 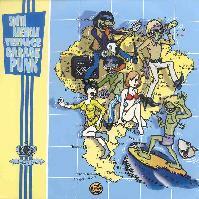 "SOS Mesdemoiselles" and "Black Hair" both have a 60's beat and vibe with mucho cool organ and a rockin punked out edge. And "(There Could Be) Only One" and "Thank You" feature 60's organ driven pop-rock at it's best. I really dig the female vocals on these songs that sound like Cindy Lauper headlining a Nuggets retro festival. Visit the Curlee Wurlee web site at http://www.curleewurlee.com. Les Slow Slushy Boys are a combo from France whose "Slush Puppy" and "Das Weiss Der Teufel" consist of the most funky trippy jazzy R&B laden and totally groovy 60's dance party music you've heard in over 30 years. These tunes are guaranteed to get your fingers snappin and your toes a tappin. Don't complain to me about being retro... this is fantastic stuff!! Email Les Slow Slushy Boys at larsen@larsen.asso.fr. For more information you can visit the Butterfly Records web site at: http://www.butterfly-records.com. Contact via snail mail c/o Butterfly Records; PO Box 31225-08080; Barcelona; Spain.